Posted by Grant Siddall on April 12, 2019 in News, Top Stories. Diversity is one of Ferris’ core principles, but as the university continues to lose international students, some people are worried about its subsequent loss of cultural diversity. Since 2015, Ferris has experienced a significant decrease in international student enrollment. In 2015, the university had 536 international students. That number has since decreased to just 238 in 2018, a 56% loss over three years. As overall enrollment declines at Ferris, the decrease in international students is responsible for 20% of the loss. The decline can be attributed to a variety of factors, both financial and political. Dr. Piram Prakasam, Executive Director of International Education at Ferris said the decision to make some graduate degrees popular amongst international students fully online, such as information security and intelligence (ISI), along with reduced funding has contributed greatly to the decrease. “If you are an international student here in the United States, you can only be here as a regular on-campus student, not an online student. Meaning you can’t have a degree in the United States by being an international student residing in the US taking completely online classes, which means students coming to the graduate ISI program are not qualied to be here because our program is online,” Prakasam said. Prakasam said reduced funding has changed the way Ferris must market to international students. Previously, Ferris paid for education consultants in foreign countries to recruit students. Without having funding to pay consultants, international recruiting has been forced to improvise their recruiting tactics, contributing to the decline. Indian Ferris heating, ventilating, air conditioning and refrigeration (HVACR) senior Anirudh Baliga found Ferris through an education consultant and said he is concerned about the lack of diversity stemming from the loss of international students. International enrollment has also declined nationally, though at a much slower rate. From the 2016-17 to 2017-18 academic years, international enrollment at American universities declined 7% according to insiderhighered.com. The overall decline can be attributed to a variety of factors, some of them political. President Donald Trump’s travel ban has not seemed to affect international enrollment, as Iran is the only country impacted with a signicant amount of students studying in America. The number of Iranian international students has actually increased nationally by 1.5%. At Ferris, student enrollment from Iran has grown since 2015 from zero to one. However, many experts believe the increasing difficulty of obtaining a visa along with added punishments for visa violations have deterred international students from seeking education in America. The political aspect of the decline goes beyond American politics. Saudi Arabia sends the fourth most international students to America. Due to governmental changes reducing the amount of scholarships given to international students, the country has seen a major decline in students seeking foreign education. This has greatly impacted international enrollment at Ferris. In 2015, Ferris had 205 Saudi Arabian students, totaling 38% of the international student body. 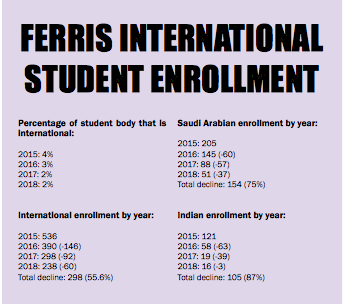 In 2018, Ferris had just 51 Saudi Arabian students, totaling 21% of the international student population. The loss of Saudi Arabian students has accounted for more than half of Ferris’ overall international student decrease and is something Ferris President David Eisler addressed with the Michigan House of Representatives in March. “We have also seen a significant decline in the number of international students coming to Ferris State University, particularly from Saudi Arabia, which was our largest group of international students. This is due to a combination of factors, most notable the Saudi government scaling back scholarship programs fund overseas education, and our own country’s immigration stance and travel bans,” Eisler said. Ferris has also seen a steep decline in Indian students. During the 2015-16 academic year, Ferris had 121 students from India, its second largest source nation to Saudi Arabia. By 2018, that amount had decreased by 87% to 16%. Many Indian students were recruited to Ferris through education consultants, and many of them attended Ferris for the ISI graduate program. Because that program is now fully online, it has greatly reduced the amount of Indian students seeking to attend Ferris. Prakasam said because master’s degree programs have so many online classes, for now and the immediate future, the international education office is focusing their recruiting on undergraduate programs that have vacancies for international students to fill. “We have identified 12 to 15 programs and we primarily recruit for those programs by traveling around and meeting students in high schools and education fairs without working with education consultants. Which means the staff is traveling around the world recruiting for Ferris and doing electronic marketing. But it takes time. It’s like changing the direction of a ship and it’s going to take a few more years to really shift the direction,” Prakasam said. The above information was gathered from the Ferris Fact Book.